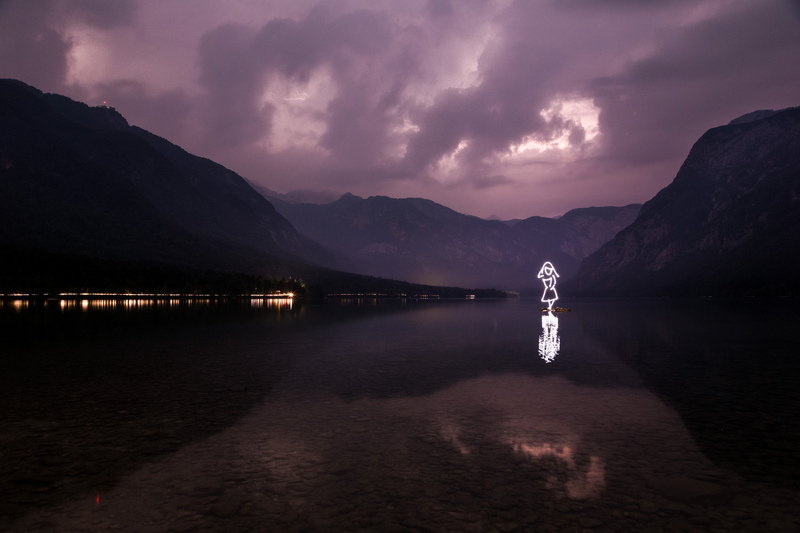 Light painting in Bohinj Lake, whilst a lightning storms plays across the surrounding peaks of the Triglav National Park. The white balance is as shot – the lightning picking out the distant peaks in a curious purple glow. Wading out to the little rocky island to light paint, whilst the thunder and lightning bounced around the surrounding hills, was a slightly nervous endeavour, but worth it for the result. I shot a few goat versions first, which I might post, then just one of the girl. Despite the break in her arm, it seemed so clean that with the storm rolling down the slopes into the valley I thought I’d call it a day. It’s a while since I’ve done any light painting, as the whole process just takes too long to fit around busy work loads. Using a sock as a diffuser, however, has made the process much less haphazard, and so our recent holiday gave me a chance to get back into it. Without a sock (or other diffuser) on your flashlight/torch, lens flare is a real threat, wiping out maybe 2 in 3 shots. For this shot, I’d also put the flashlight in a plastic bag. The distance is very forgiving with the lines. If you’d like to see some of my older light paintings, just click here. There are all created in camera by drawing lines free hand with a torch/flashlight. After about ten attempted uploads, interrupted by sporadic #badpanda messages, the file is loaded, but without EXIF data. [Update – this appears to have fixed itself]. Maybe I should have dropped the ISO – the 5D Mkiii creates some disruptive coloured noise on long exposures at 400, which I don’t see at lower sensitivities – but at over ten minutes a shot, the lightning was just too uncontrolled. A sudden flurry of strikes and the sky overexposed, so smaller time windows were needed. Although the actual forks of lightning aren’t especially visible, they have the neat effect of freezing the sky mostly in place. Hope everyone is having a superb weekend. Catching up now.